The U.S. mid-term elections are fast approaching. I encourage everyone to go out and vote next Tuesday, November 2, 2010. In honor of the political system that has given us all so much, I’m offering $2 off your next order of Mars Colony (pdf or book) or Hero’s Banner (pdf only). All you have to do is post, tweet, or otherwise tell me what politician, living or dead, you’d most like to play Mars Colony with. Send me your response (or a link to your response) along with you PayPal payment, and I’ll refund your order by $2. Sale ends midnight, November 2. This entry was posted in Announcements and tagged Hero's Banner, Mars Colony on October 26, 2010 by Tim Koppang. It’s made out of aluminum, cut on a CNC machine, and chromed. Thanks, Rich! This entry was posted in Announcements and tagged CNC, looks official on October 16, 2010 by Tim Koppang. 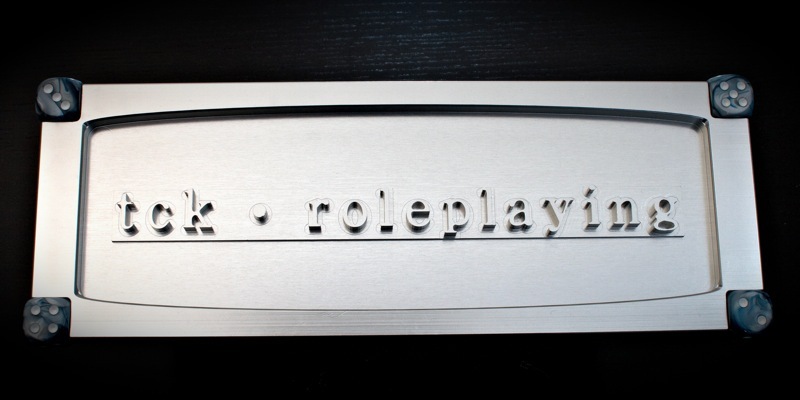 Return to the TCK Roleplaying Website.